Home » Information » How Long Does A Toaster Oven Take To Preheat? See What I Found! Thinking about buying a toaster oven? Or perhaps you’d just like to know more about cooking & heating times for yours. 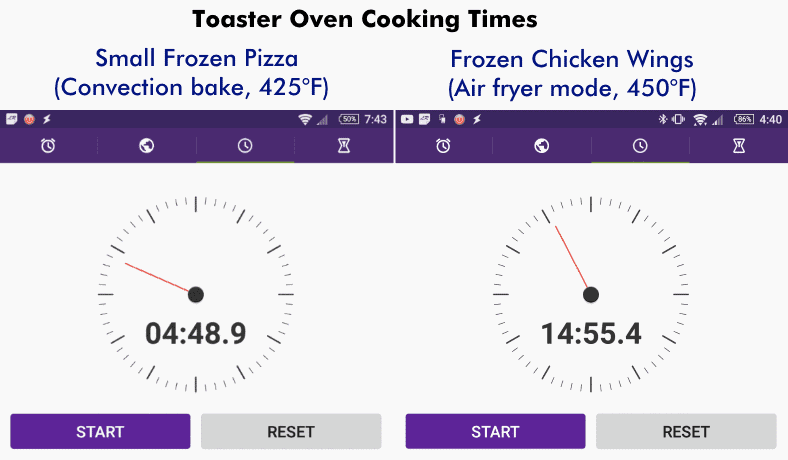 In either case, I’ve done some hands-on testing to tell you everything you need to know about preheating times, cooking times, and more. If you’re wondering how long it takes to preheat a toaster oven, you’ve come to the right place! Additionally, there’s some interesting information to demonstrate why they offer some real advantages over larger ovens. 2. How long does a toaster oven take to preheat? 3. Do you have to preheat a toaster oven? 7. How long does toasting bread take? How long does a toaster oven take to preheat? 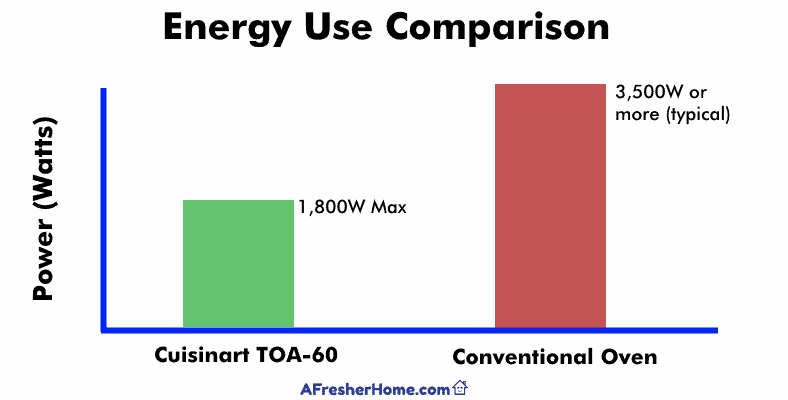 Smaller ovens (like those mostly suited for small meals or 4 slices of bread) will perform differently than larger, multi-function toaster ovens like the Cuisinart TOA-60 1800W toaster oven/air fryer I reviewed here. 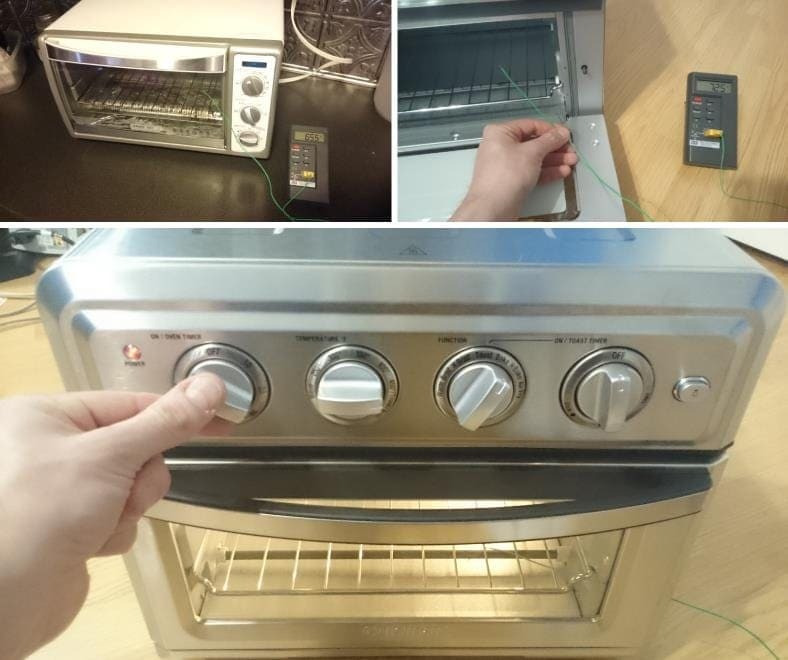 To find out some hard numbers I used 2 example ovens and did hands-on testing for both. I found out some very interesting things! 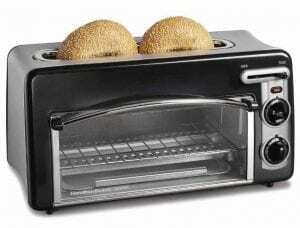 Top: For the first toaster oven I used a typical-size Black and Decker TO1675W (1500W) model. Bottom: Setting up the larger Cuisinart TOA-60 model, which is not only an oven but features an air fryer as well (1800W power). For both I used a high accuracy, high temperature probe and digital thermometer. For my test setup I used 2 ovens to get 2 readings and have a better understanding of how long it takes a toaster oven to warm up. For both, I used an accurate high temperature probe and digital thermometer, set them to their convection bake selection, and measured the time needed to reach 450 degrees Fahrenheit (232 degrees Celsius). How long to preheat an oven to 450 degrees? There you have it! An average toaster oven takes around 5-6 minutes to preheat to 450°F (232°C) while a larger one like the Cuisinart takes only slightly longer. In most cases, expect a preheat time of close to 5 minutes. Smaller toaster ovens may take less time, but as a rule, 5-6 minutes is a reasonable expectation for most on the market. What’s interesting, however, is how they compare to a larger more powerful traditional oven. Do you have to preheat a toaster oven? Preheating a toaster oven is not necessary, but is recommended. The reason is that it gives the oven time to heat up to a ready temperature and cooking environment before the food begins to be warmed during cooking. Ideally food begins cooking at the desired temperature for the recommended amount of time instead of having it start cold. In the case of not preheating the oven, the food is exposed to a rising temperature instead of having a consistent and adequate temperature 100% of the time from the beginning. Think of it as waiting for the shower to have warm water before you get in. Is it necessary? Not at all. But it’s definitely preferable in most cases as it lets you get started correctly as soon as you’re in. It’s not just preheating times that matter when you’re considering buying or using a toaster oven. What about cooking times? How long will you have to wait for your dinner, and how well do they typically work? In order to find out, I cooked a variety of foods in my wonderful Cuisinart TOA-60 toaster oven/air fryer. Especially important was finding out it they’re not just faster at preheating but cooking as well. I measured the cooking times for several different foods including toast using my Cuisinart TOA-60. As it features both convection baking and an air fryer feature I put them both to the test. Here are 2 of the results I got during testing. Pretty fast, and certainly faster than a larger oven. It’s important to clarify that I used the convection oven (baking) option in my test oven. Convection baking has better results in many cases and is especially great for items which are better with an even, crunchy crust. An air fryer also has many benefits and allows cooking great, healthy foods you love but without the oily mess and fatty health concerns normally associated with fried foods. For my test examples, a small frozen pizza took only roughly 6 minutes to become perfectly toasted and crunchy with the recommended internal temperature of 165 degrees. (Note: for convection baking, it’s recommended to reduce the target temperature by 25 degrees). Cooking test foods and measuring cooking times. 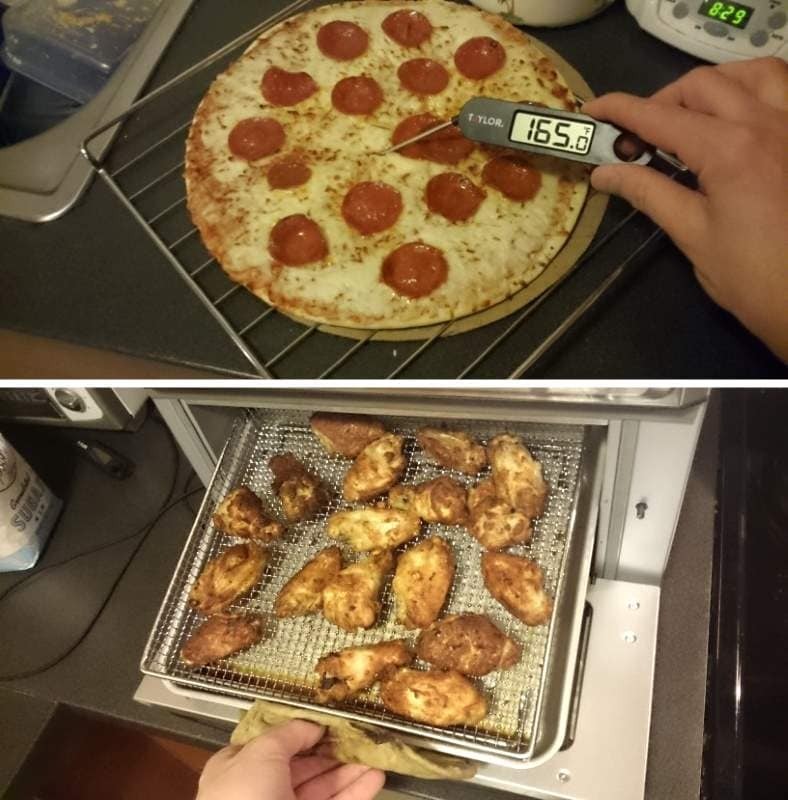 I got perfectly cooked pizza with an evenly crisped crust in about 6 minutes and delicious air-fried wings without unhealthy oil in about 15 minutes. While the Cuisinart owner’s manual recommends about 20-25 minutes, my wings were very well done in just under 15 minutes. Additionally, I estimate I overcooked them just a bit so it’s more like 13 minutes or so. The results were excellent, with minimal, if any, preparation. Sure, it’s great that you only have to wait about 5 or 6 minutes or so for one to heat up. But is there an advantage over a traditional and much larger oven? And how long does one of those take to preheat? I had to find out! 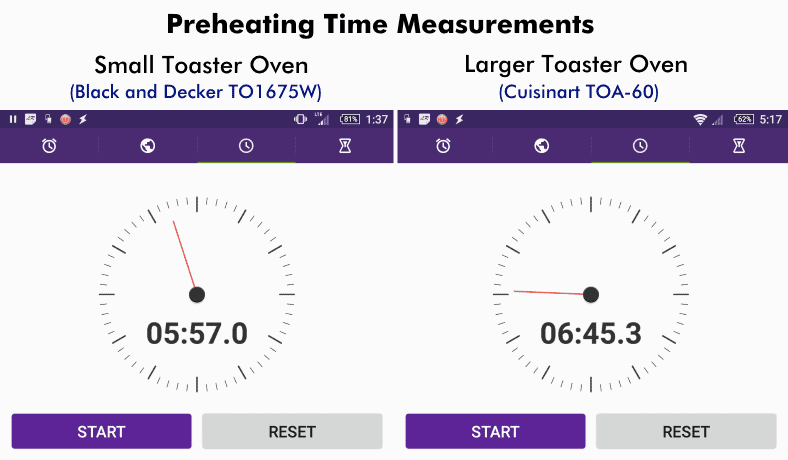 Similar to my toaster oven measurements, I measured the pre-heat time for my Samsung larger oven and here’s what I found. 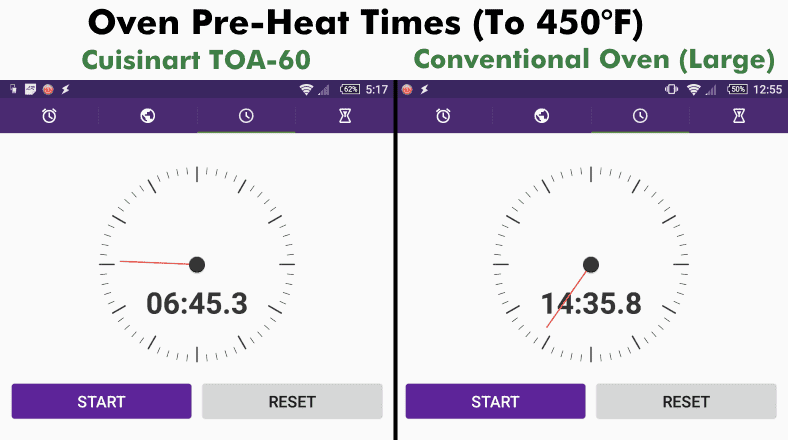 Shown: A comparison of time measured for preheating a toaster oven to 450°F (232°C) vs that of a larger, more powerful oven. Wow! Quite a difference! Just over twice as much time is required. What I found surprised me. While my oven is large and fairly powerful (a nice Samsung with many features) at around 3,600W, the Cuisinart toaster oven took less than half the time to preheat. Needless to say, there’s a definite advantage here when using a toaster oven when it comes to how long you’ll have to wait before cooking a meal. That’s much less time wasted. But wait – it gets even more interesting. I’ve put together a simple graph that helps explain how much power one uses vs the other. A basic graph showing the energy a good modern toaster oven uses vs that of a larger conventional (standard) oven. Basically, you can expect a regular oven to use twice or more the electrical power of a toaster oven. Over time the toaster oven will cut cooking times and energy use significantly. Indeed, while you might think a conventional (standard) oven is larger and more powerful that it’s better. The truth is, that’s not the case at all with a few exceptions. Conventional ovens take extra time to heat the air and preheat because of the larger air volume inside. As they’re more compact and the heating elements are normally closer to the food, toaster ovens can also cook faster in many cases despite being less powerful. Based on my preheating, cooking, and energy use comparisons here, we can confidently say a toaster oven will cut your waiting, cooking, and energy use costs by about 1/2. Of course, toaster ovens aren’t ideal for everyone and all situations. For example, I often do “meal prepping” and cook large amounts of chicken or other items on baking pans which need a lot more room. For smaller personal or family sized meals (especially frozen foods) toaster ovens however are much more efficient and easier to use. Some models like the Cuisinart TOA-60 I mentioned can even fit a whole 4lb medium-sized chicken for cooking. How long does toasting bread take? In addition to the other toaster oven measurements and test I performed, how could I forget one of the most important? I’ve always been a toast fan so I just had to find out how an oven compares to today’s typical inexpensive pop-up toasters found everywhere. Toasting time measurements using 4 slices of white bread. I tested each of 3 darkness levels available on my test oven. Toasting with an oven takes slightly longer than a simple electric pop-up appliance but gives better results, I found. Testing white bread toasting quality & times with my Cuisinart oven. Toaster ovens are able to produce consistent, excellent toast quality (if you select a good oven, that is). Above: With the darkness selector set to Medium, I got perfectly medium-toasted bread in just under 5 minutes (with no preheating necessary). There are pros and cons when it comes to using traditional electric pop-up toasters vs a toaster oven. However, in my opinion and based on my testing, toaster ovens are a better choice and you’ll be far happier with them. While electric toasters are very simple often very inexpensive, what I’ve found is that they’re often unreliable, fail early, and are difficult to adjust for the results you want. Additionally, I’ve seen many cases where they would begin to perform worse over time. By contrast, a good quality toaster can deliver consistent, nearly perfect toasting due to including features like a toast timer (which shuts the oven off after use) or toast darkness presets. There is a trade-off, of course: a pop-up toaster can take a bit less time. The problem is that you often get uneven toasting and sometimes the toast is too dark. The end results were excellent and it was honestly some of the best toast I’ve ever tasted in my life! Considering the added cost of getting a better-performing electric toaster, why not just get a quality toaster oven? Many are affordable and as low as around $50, making them a better value overall. 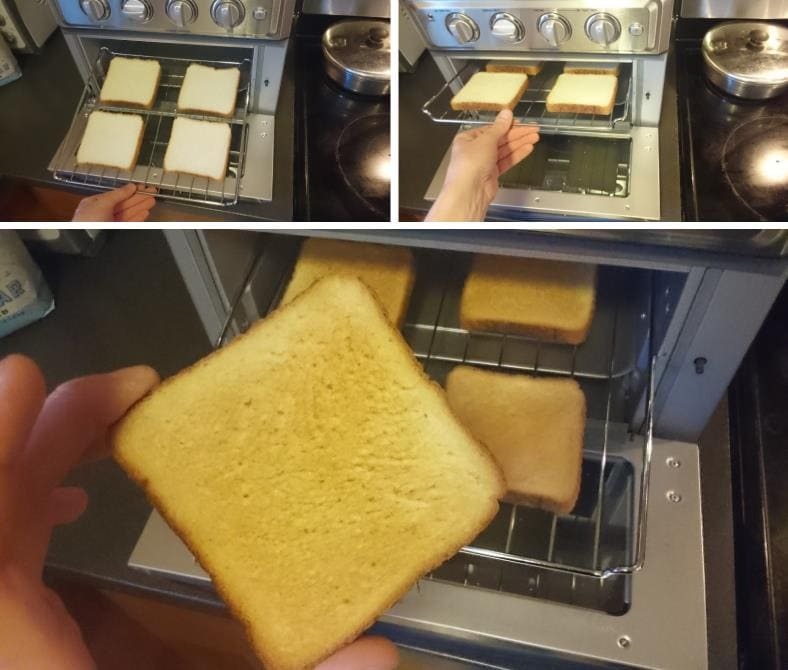 Some toaster ovens offer the same convenience as a pop-up toaster built in. This popular, low-cost Hamilton Beach Toastation 2-slice provides the best of both worlds. Most ovens sold today typically include the following features and what you should shop for mainly depends on the types of food you’ll enjoy. Additionally, convenience is a huge factor in my opinion, too, as some models offer better options to make cooking less bothersome. Having tested a variety of ovens and cooking modes, I can tell you that the air fryer and convection oven features are simply some of the best you’ll find. They’re well worth spending a little more money for. Here’s a few features I recommend considering when shopping. Several are available in products below $100, making them affordable for many people. 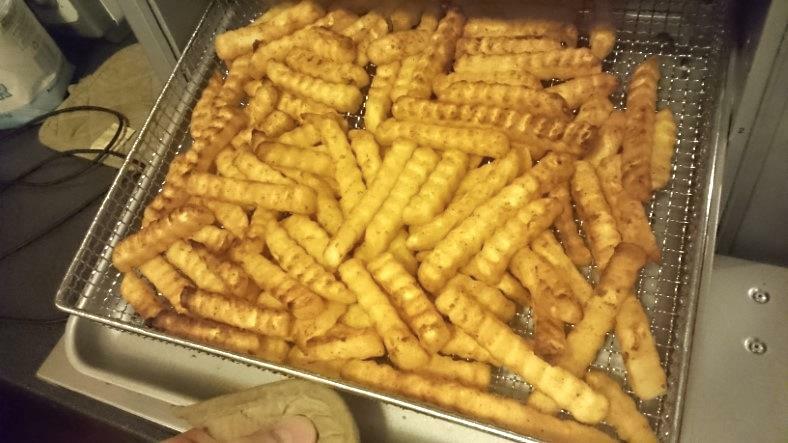 Love fried foods like delicious crisp, browned french fries? Buying a toaster oven with the air fryer feature allows fried food taste but is much healthier and easier, too. Convection ovens work by using a fan or fans to move the hot cooking air constantly. This results in an evenly crisped or toasted outside of the food as well as better heat distribution for more even internal cooking. As convection ovens are more effective, it’s often recommend that you reduce the temperature dial by 25 degrees. If you’re wondering about which toaster ovens are great choices for your money – but you’ve got a budget – check out my great post with the best values in toaster ovens under $50. One of the absolutely best products I’ve had the pleasure to own is the Cuisinart TOA-60 toaster oven and air fryer. It’s what I used to cook the wonderful and delicious foods you see in the pictures here. It’s such a great model that after testing and reviewing it, I’ve awarded it my Editor’s Choice. 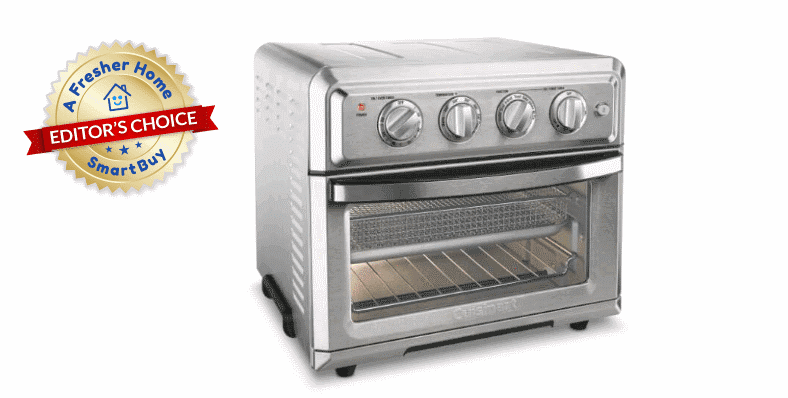 Looking for a great toaster oven that gives fantastic results? Based on my hands-on testing, the excellent Cuisinart TOA-60 is one of the best models sold today at Amazon. 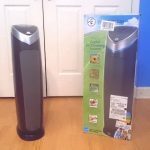 GermGuardian AC5250PT Air Purifier Hands-On Review & Test - What's It Really Like?